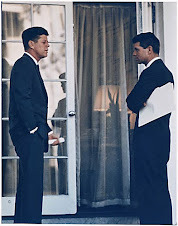 Justice For Kennedy: Hughes film in "JFK: The Lost Bullet"
Hughes film in "JFK: The Lost Bullet"
I found something interesting while looking for something else. 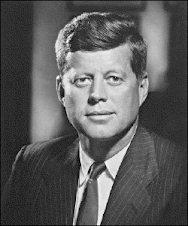 I watched National Geographic's, (really Max Holland and the CIA's) "JFK: The Lost Bullet" today while looking for something else when this caught my eye. 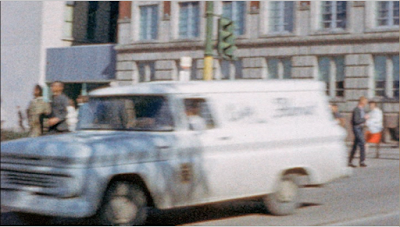 I'm going to post a few frames of this. This starts at about 31:46 into the DVD of this show. 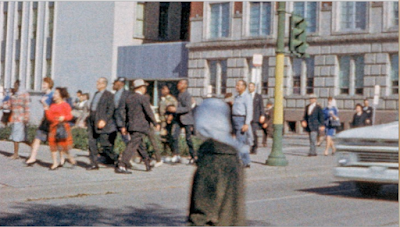 Take a close careful look. 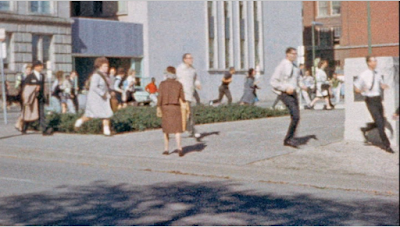 Do you see what's wrong with all of these frames? 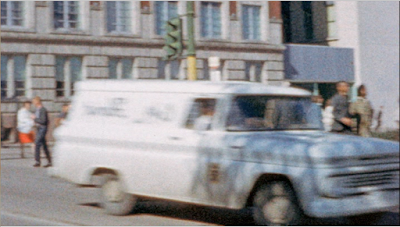 This is the Hughes film. 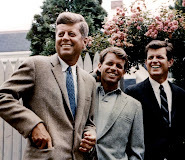 So, could you tell? 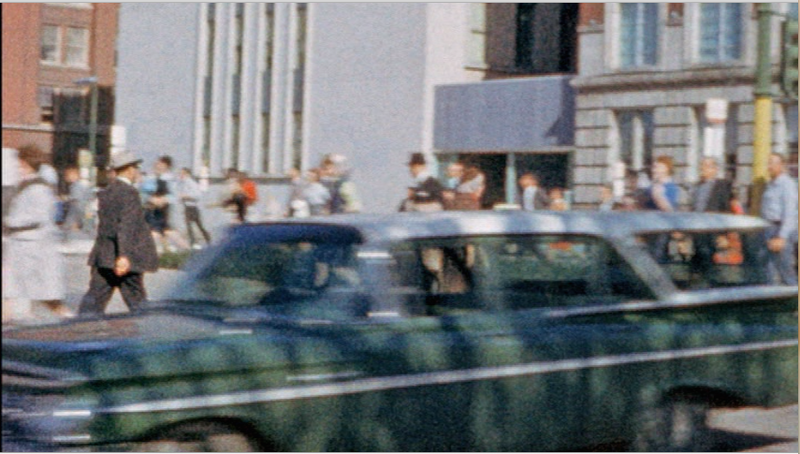 The answer is, of course, is that these frames, this whole sequence is reversed. 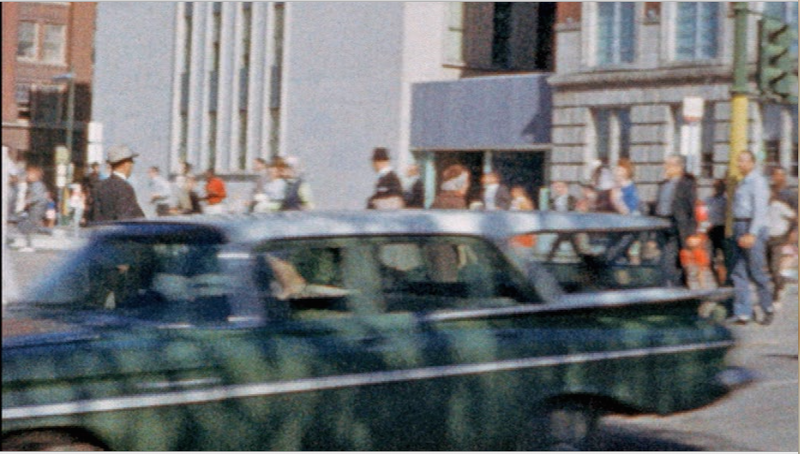 This is shown to make you think people are running into Dealey Plaza, which they are, but when horizontally flipped it makes you think they are running down Elm St., which they're not, they're running down Main St. into Dealey Plaza. 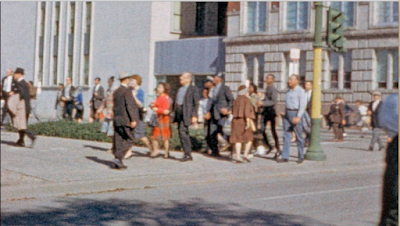 Also, this gives you a distorted view of Houston St. 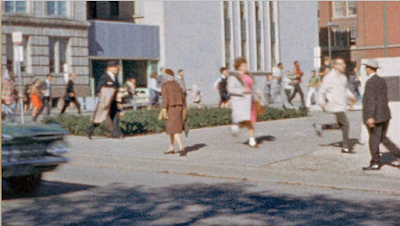 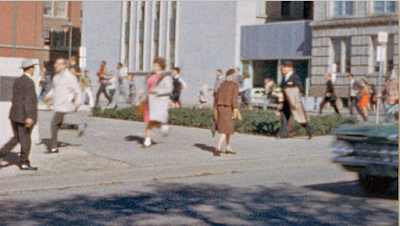 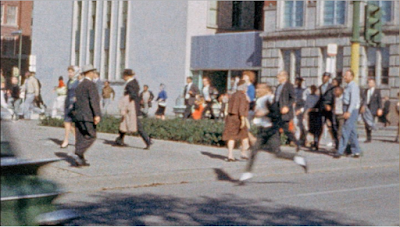 The older woman in the brown hat, top, and skirt is, in stark contrast to everyone else, walking slowly away from Dealey Plaza. 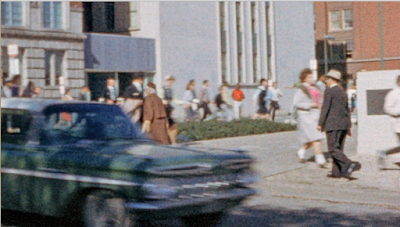 She has always interested me because of how calmly she's moving away from Dealey Plaza. 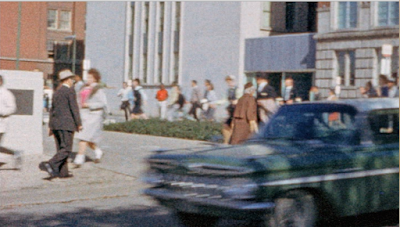 There is a man behind her who also walks away from Dealey Plaza who may or may not be her husband, brother, friend, or have no relationship at all to her. 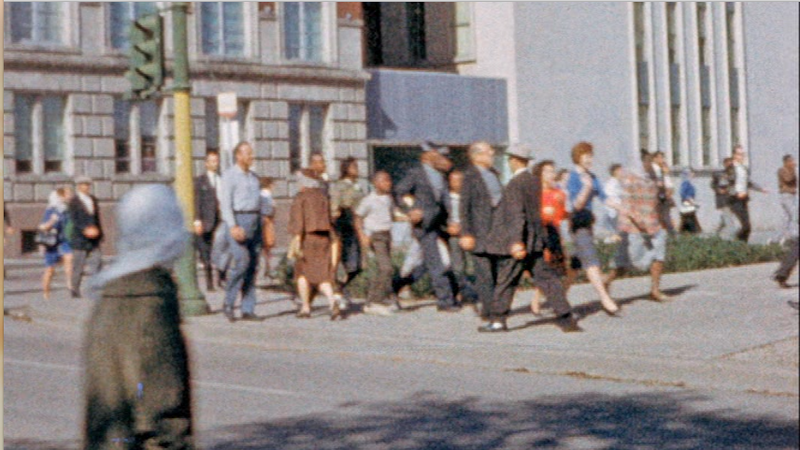 The Hughes film can be seen here on Youtube.com. 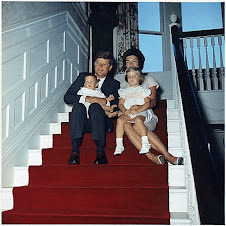 Greg Burnham also thinks these two are odd. But, what's odder still is that Hughes filmed them and seems to focus on them. 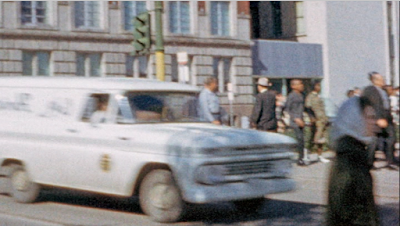 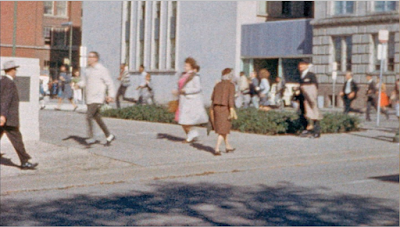 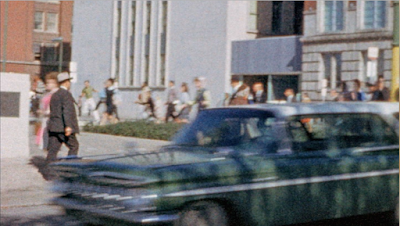 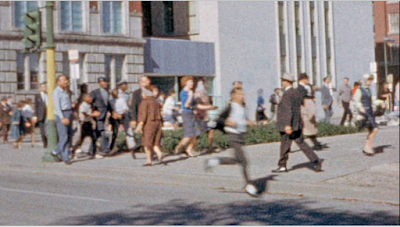 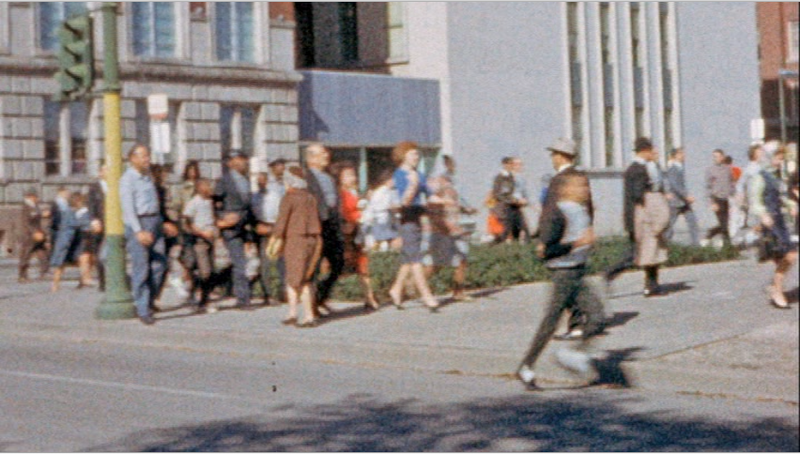 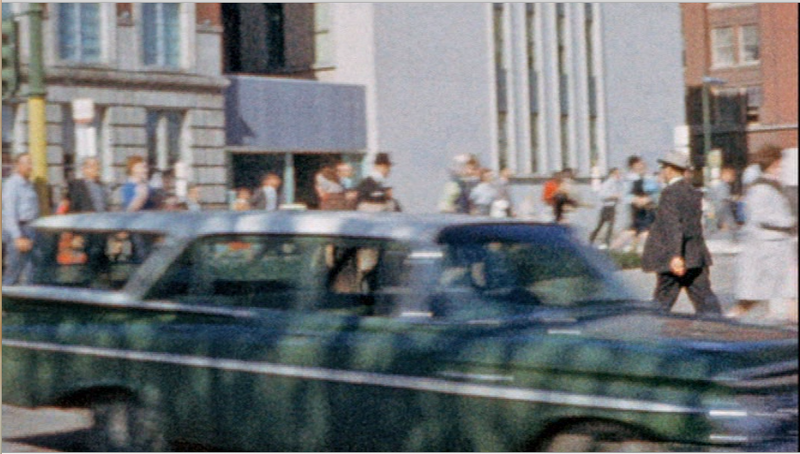 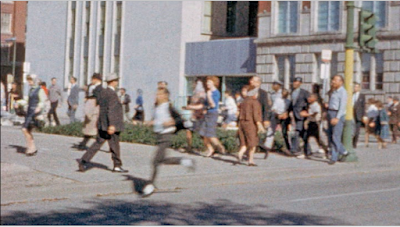 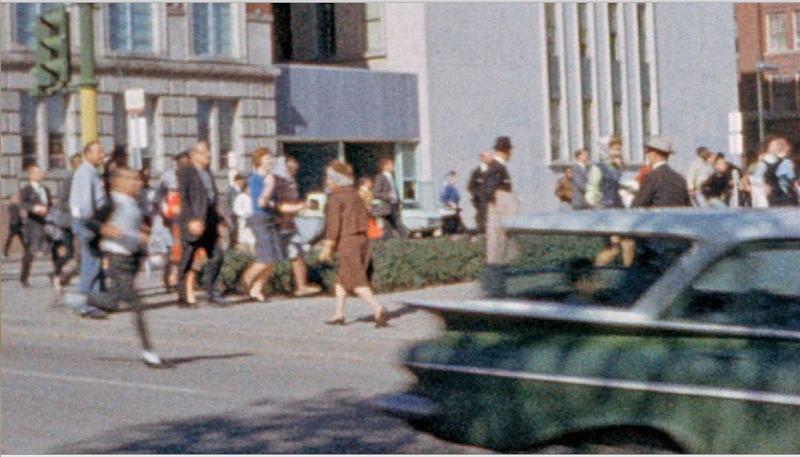 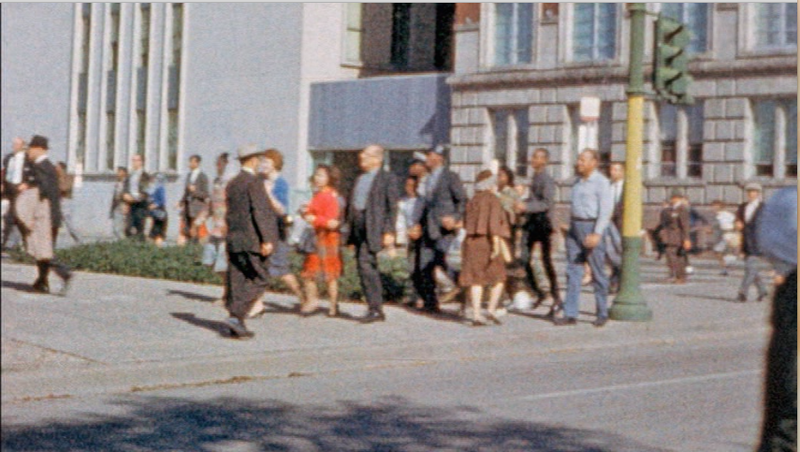 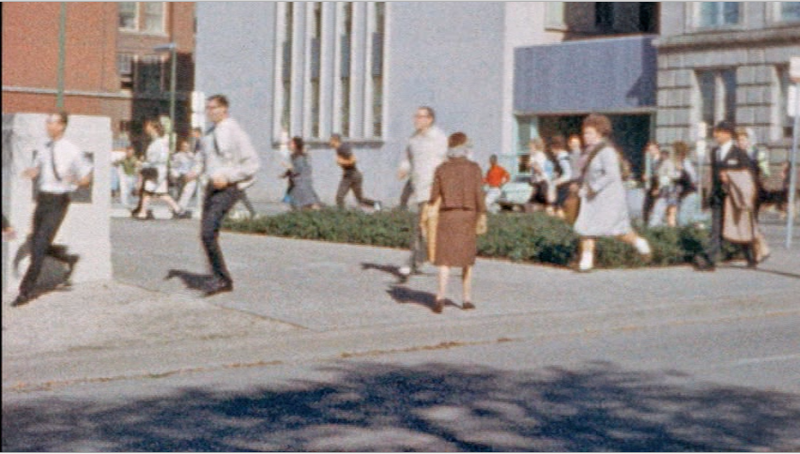 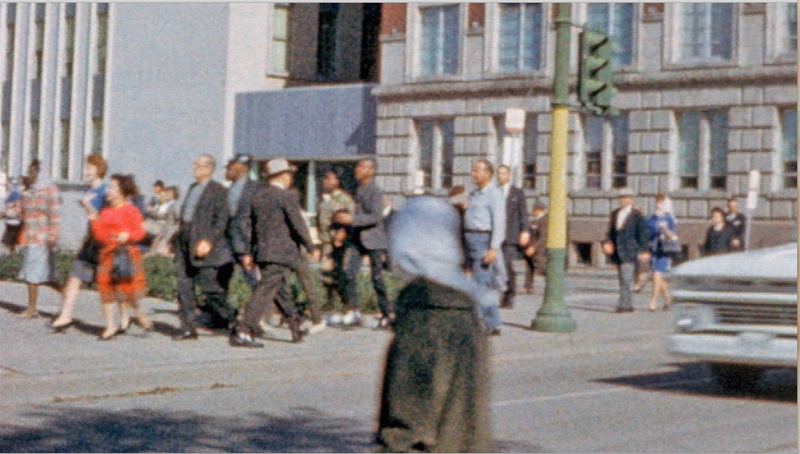 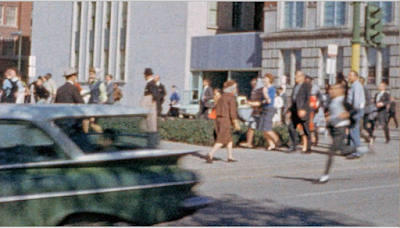 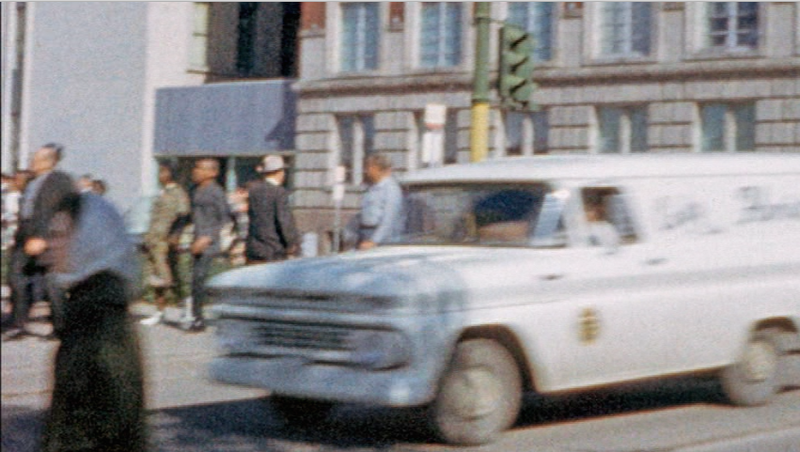 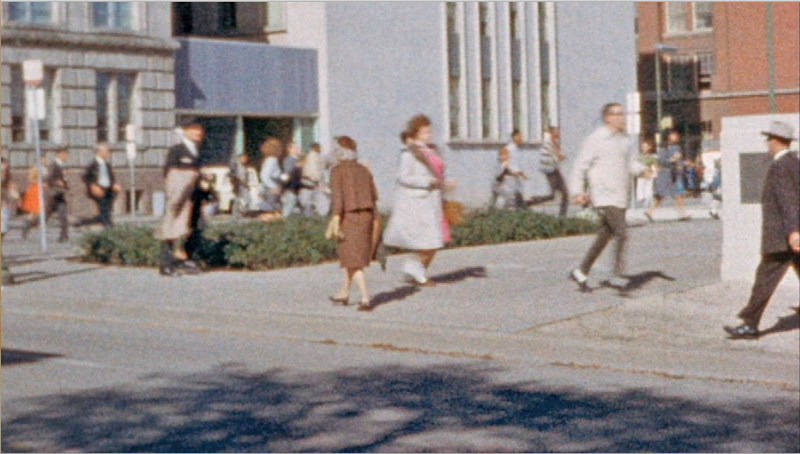 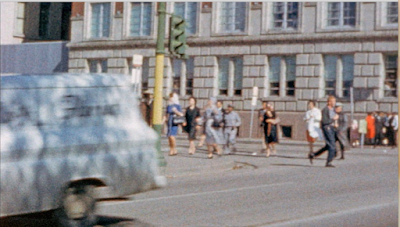 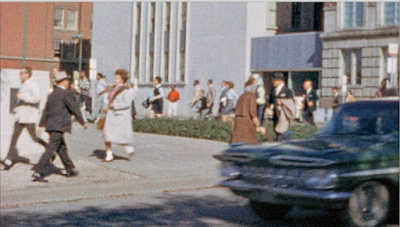 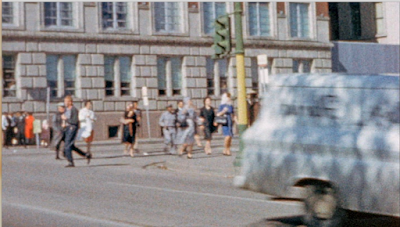 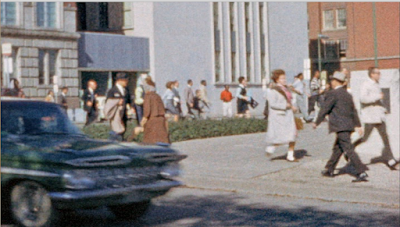 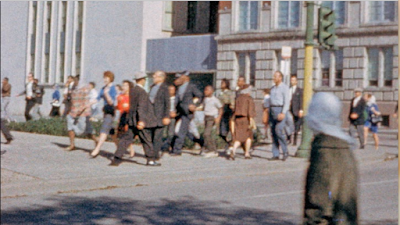 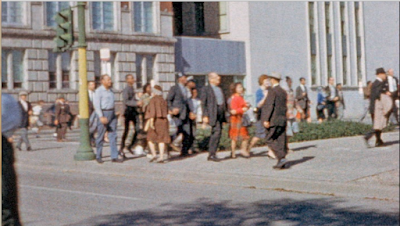 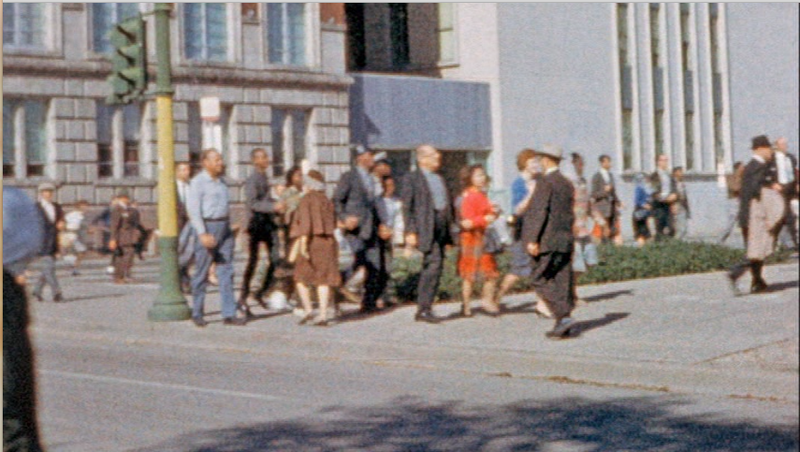 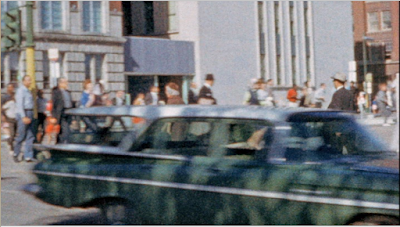 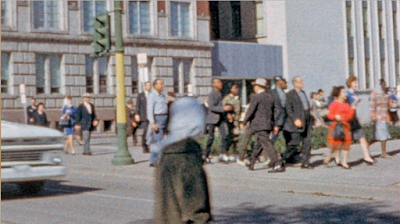 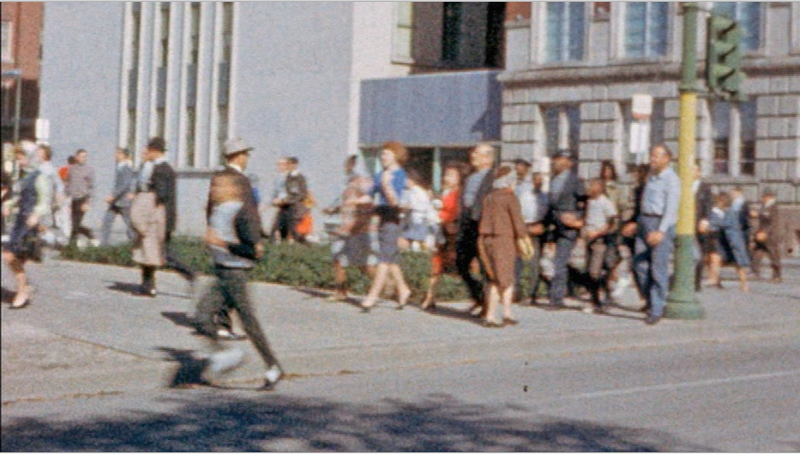 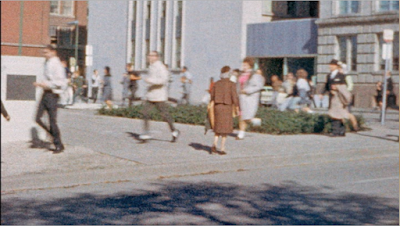 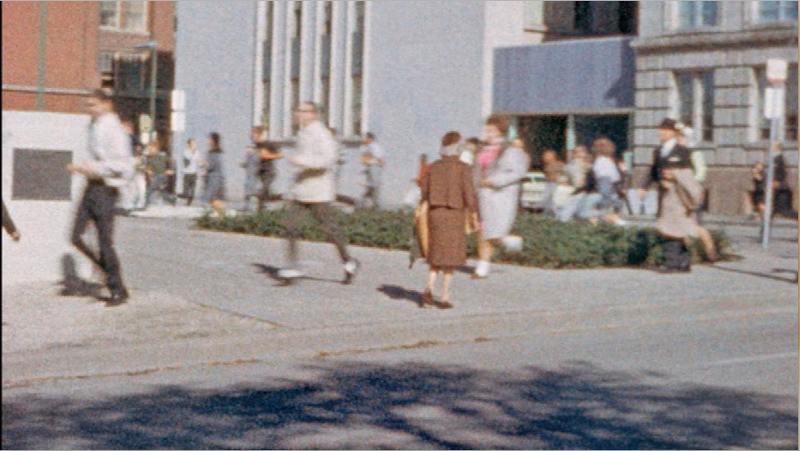 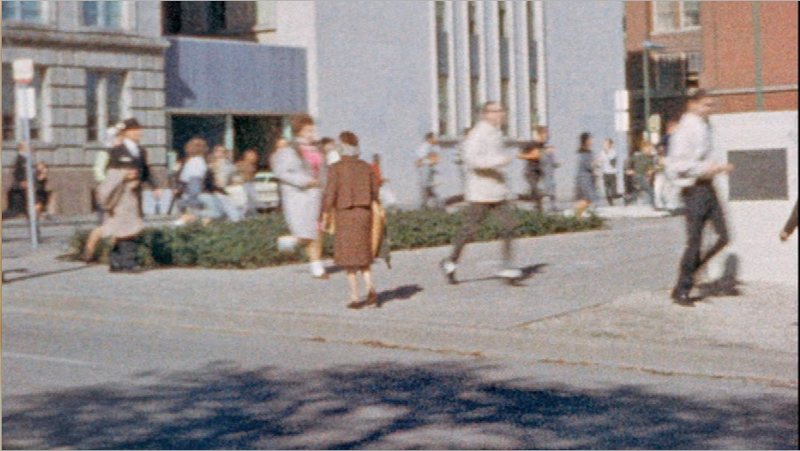 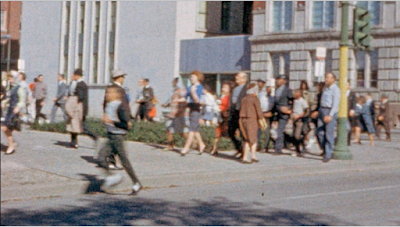 Hughes's film does not follow the direction of anything, either vehicles or the rushing crowd running into Dealey Plaza, that are moving from his right to his left, no, he films them. Hughes' camera moves from left to right. 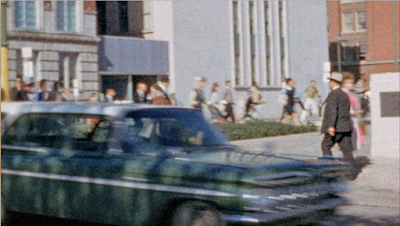 The Robert Hughes film is complete and stabilized here.